I am a 15-year-old at the time of creating this panel. 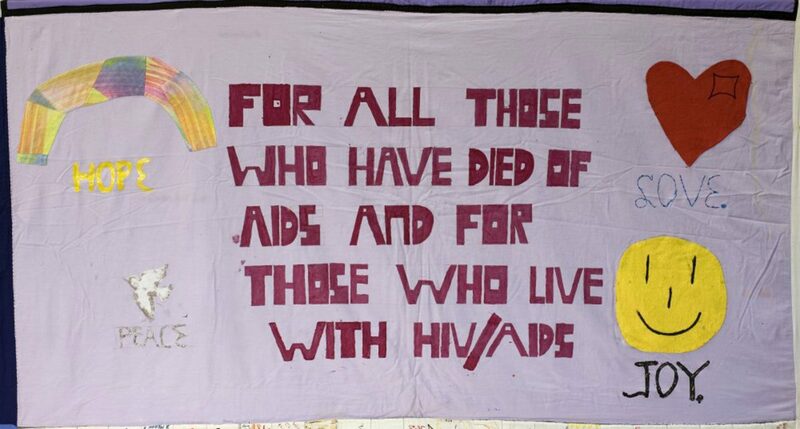 I wanted to do something for ALL those who live with HIV and AIDS. To offer them Hope, Love, Peace and Joy. These four words I actually got from a Christmas card. And as Christmas is supposed to be a time of goodwill for humankind, I thought it really appropriate. It’s also a panel dedicated to my Uncle Robin. I was born on Uncle Robin’s 18th birthday, and over 15 years we had double cakes and goodies whenever we could be together. Always phone calls if we couldn’t be together for other reasons. Now my birthdays will never be the same, there will always be something, more importantly, someone, missing. I will always love and miss him and will live my life to be tolerant of all people, just the way he taught me to be. Love and care for each other, always. Remember with Hope, Love, Peace and Joy we can live in a world free of prejudice and indifference.